On May 24, 2002 the first sim was submitted in the history of the USS Victory. The ship would launch a few days later under the command of Commander Jordan Hurne as a split from the Kodiak-A. That was ten years ago. 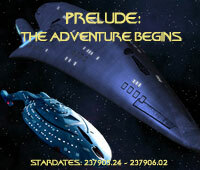 Voyager had just finished its run and Enterprise was airing new episodes. There were no such things as smartphones and social networking was in its infancy. The Victory would see much change over her run. She served as both an independent ship as well as a support vehicle for Starbase 118 Operations. Five different commanding officers would take her captain’s chair. The Victory would also spawn several splits of her own including the Columbia under Captain Mal Avatar and the Aurora under Captain Megan Parker. The ship would also later be the first command of Captain Andrus Jaxx. The Victory was pioneering in many ways. Prior to the arrival of the Wiki, most ships had their own independent websites. The Victory was no different, but its website included detailed mission summaries and images for all crew members. Many of these summaries have found their way to the wiki which has helped to keep the memory of those past missions alive. The Victory’s motto, “Honi soit qui mal y pense” is actually a French phrase meaning “Shamed be he who thinks evil of it.” A phrase that you might see if you look carefully on the Royal coat of arms of the United Kingdom. The ship was named for the HMS Victory, the ship commanded by Admiral Nelson at the Battle of Trafalgar. Both Nelson and the Victory were mentioned at times throughout the run of Star Trek: The Next Generation. Perhaps it is the ship’s connection to British history that has helped to keep her relevant in the fleet for all these year. Some mysteries may never be solved. Still unknown to this day is the reasoning behind the ship’s abnormally high registry number of NCC-362447. Many commanding officers embed “Easter Eggs” in the registry number, but to date no one has yet been able to crack the code. During one of the early Victory’s most intriguing missions, several of the crew came across a mirror universe version of the ship and its crew. But this was not the mirror universe of DS9, instead it was a universe that stayed true to the mirror universe encountered in the TOS episode “Mirror Mirror”. The writers presumed that there were multiple mirror universes. This adventure gave the writers a unique opportunity to play their characters as opposites, which lead to some controlled mayhem. Some examples included officers plotting to assassinate Captain Hurne. The ship would change hands multiple times. When Captain Hurne took a leave of absence, Commander Parker took over. Parker had previously been the ship’s CMO as well as a Victory original. She would eventually launch the Aurora upon Hurne’s return. The third commanding was another officer who rose through the ranks aboard the Victory, Captain Robin Phoenix. Phoenix would take command of the Victory following Hurne’s retirement. Ambassador Ventu, an officer under Captain Phoenix at the time recalled when “Phoenix had so recently taken over and we’d lost our first officer, so Julia Harden — our CMO and very recently promoted lieutenant commander — ended up acting XO for a ship full of ensigns and jaygees. I don’t know how they/we pulled it off, but I remember having a lot of fun!” Sadly a few years later the Victory was decommissioned, but it was hardly a permanent state. In 2387 Rear Admiral Rocar Drawoh resurrected the ship before turning over the CONN to then Commander Jaxx. The Victory would continue to operate as a standalone vessel for another year before becoming the primary support vehicle of Starbase 118 Operations under Commander Kalianna Nicholotti. When asked about memorable missions many of the Victory’s more recent players mention missions such as “Empire Falling” and “Between a Rock and a Hard Place.” However if they had to pick just one it was “The Space Race” that stood out. The first half of the mission had to with the Apollo mission to the moon, where the crew of the Victory inadvertently collided with the spacecraft en route to the moon. According to Captain Jaxx, “In a quick stroke of genius, the crew was able to use the historical records to rebroadcast their data and used their voices from the recordings.” In essence it was the Victory crew that faked the moon landing! It was perhaps the second half of the mission that players remember. There was an odd encounter with a Q that gave writers an opportunity to explore the darker corners of their characters. Next up for the Victory is a refit that will give her a fighter bay for the Marines aboard. The past two missions needed the fighter wing nearby, so Commander Nicholotti thought it would be a good idea to outfit the ship with a functional fighter bay. With the latest upgrades, the Victory projects to remain a mainstay in the fleet for many years to come. Congratulations Victory on your tenth anniversary, may the next ten years be full of adventure. Your crew would not have it any other way. This is great story and something I’d love to read about other ships and surely Ops. Others maybe don’t have 10 years of history, but they do and hearing about the missions that made the impact (historical like the Moon Landing – yes it made me laugh) are a great read.